Claire's Dad came back from the farm on Monday just in time to help me fire the builder that has destroyed the last 9 months of my life but this is a happy post and the sad post is here. In the rush to get to the house in time to meet with the ex-builder about 9 Bantam chicken eggs where dropped in Claire's hands and she was told to get the incubator working and put the eggs in as soon as possible as they were loosing temperature due to the effectiveness of the Discovery 3's aircon and a 4 hour drive from the farm. 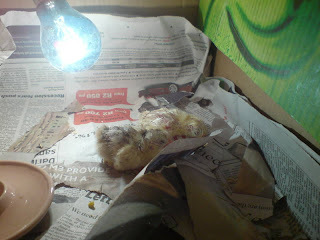 Claire's panic and worry and general affection and love for all animals won the day and on Monday we got two chics out of their eggs (1 was a caesarian type affair, but it is breathing and alive and so it counts). We knocked up a brooder (pic) to keep the little things warm and safe from the pride of savage domestic cats and they seem to be doing well. Update (10/09/2008): We now have 3 chiclets. The first born is called Godzilla (my name for it as it rampaged over the other eggs when he hatched), but his real name is Churchill. Number 2 and 3 are as yet unchristened.